AUSTIN, Texas (AP) — A county judge on Texas' Gulf Coast has written to fellow Republican and state Land Commissioner George P. Bush, decrying that there's "no adequate relief in sight" a year after Hurricane Harvey's devastation. AUSTIN, Texas (AP) — The Texas General Land Office has released an internal audit criticizing the Alamo's accounting practices. AUSTIN — Texas Land Commissioner George P. Bush appeared headed for a victory in the Republican primary, edging past former commissioner Jerry Patterson and two other candidates as he worked to head into the November election without a runoff. In early returns, Bush held a sizeable lead over Patterson, who did not have a big enough share of the early vote to force a run-off. Land surveyor Davey Edwards and former school teacher Rick Range trailed far behind. NEW BRAUNFELS, Texas (AP) — George P. Bush's campaign flyers in Texas declare that he's "standing beside our president" — the one who called his dad, Jeb, an embarrassment to his family and a pathetic person. Texas Land Commissioner George P. Bush is the scion of a political dynasty but he’s standing firmly with President Donald Trump as Tuesday’s Republican primary approaches. AUSTIN, Texas (AP) — Republican Gov. Greg Abbott has refused to say if he voted for other statewide officeholders from his own party in the Texas primary. Abbott spoke to reporters Tuesday, after casting his ballot as early voting opened ahead Election Day on March 6. AUSTIN - Gov. Greg Abbott, who cast an early ballot Tuesday, wouldn’t say whether he voted for fellow Republican incumbents Attorney General Ken Paxton, Agriculture Commissioner Sid Miller or Land Commissioner George P. Bush. But he is campaigning against three incumbent Republican lawmakers, including Rep. Lyle Larson of San Antonio, who ran afoul of the governor when Larson tried to strengthen state ethics laws. Just the sound of the name puts me into instant protective mode. And God knows, the Alamo needs to be protected. But, then, I don’t have to tell you that. Poor old Alamo. Are we all doing our part? I was always told never to underestimate the power of the written word. For many of us that is all we have. We have no guns! No bayonets! No swords! No Bowie knives! Just words and heart! We need to make the most of them. AUSTIN, Texas (AP) — The unusual use of a nonprofit to manage the Alamo is overly complicated and sometimes violates state requirements, according to a preliminary audit report about state oversight of the landmark's operations. Texas Land Commissioner George P. Bush says a draft audit critical of Alamo operations that was released this week was “doctored” and the state agency has reported its unofficial release to law enforcement for investigation. AUSTIN — Donald Trump Jr. waded into the contested Texas Land Commissioner race Tuesday, backing Republican incumbent George P. Bush over his main challenger who was critical of Trump during the 2016 presidential contest. AUSTIN, Texas (AP) — Donald Trump Jr. has endorsed George P. Bush's re-election bid for Texas land commissioner, repaying Bush for breaking with his powerful political family and supporting Donald Trump's 2016 presidential bid. The president's oldest son tweeted Tuesday that "Texas conservatives have a clear choice: Bush for Texas Land Commissioner." AUSTIN, Texas (AP) — Employees of a disaster recovery accounting firm donated almost $30,000 to Texas Land Commissioner George P. Bush's re-election campaign days after his agency signed a nearly $13.5 million contract with the company to help manage the state's Hurricane Harvey response. Bush's office is overseeing the housing rebuild post-Harvey and agreed to the contract in October with Horne LLP. Three days later, 34 Horne officials collectively donated $27,500. More transparency for the nonprofit board overseeing the Alamo is a welcome move. The Alamo Trust runs the day-to-day operations of the Alamo, which is undergoing changes to increase access and historical accuracy according to a master plan developed by the state, the city of San Antonio and the Alamo Endowment, the private group that has another subsidiary trying to raise private funds for improvements. AUSTIN — Republican Jerry Patterson raised nearly $90,000 during the first month campaigning to win back his old job from Texas Land Commissioner George P. Bush, according to campaign finance reports filed this week. The sum pales, however, in comparison to the $1 million the Bush campaign reports pulling in over the last six months. The face-off is expected to be one of the most competitive statewide GOP primaries on March 6. Jerry Patterson says the fellow Republican who succeeded him as Texas land commissioner, George P. Bush, fixed very few homes in the months since Hurricane Harvey slapped ashore in August 2017. The Alamo has launched an interactive “digital battlefield” that gives online visitors an unprecedented side-by-side view of the 1836 battle compound and its appearance today in the middle of downtown San Antonio. Ruby Robinson carries her insurance documents everywhere she goes, keeping the company's denial letter in her purse in case she needs it at a moment's notice. The letter, which says she did not qualify for any money from the damage done by Tropical Storm Harvey to her Nome home, is all she has to show for hours on the phone and weeks of waiting for financial assistance. AUSTIN, Texas (AP) — What some Texas conservatives are calling the "new battle of the Alamo" has triggered an unlikely, intraparty squabble involving the rising-star scion of one of the nation's most famous political families. AUSTIN — Former Land Commissioner Jerry Patterson, who has been critical of his successor George P. Bush's handling of the Alamo and other issues, said Friday he is running to reclaim the office. “I’ve concluded that there are some things more important than me enjoying my retirement, and the Texas General Land Office is more important,” Patterson told the San Antonio Express-News. He said he would file for the Republican primary on Monday, the deadline for doing so. CORPUS CHRISTI, Texas (AP) — First Lady Melania Trump has returned to Texas to visit first responders and view recovery efforts since Hurricane Harvey hit more than three months ago. Trump and Karen Pence, the wife of Vice President Mike Pence, flew to Corpus Christi on Wednesday. Both posed for photos with emergency staff and military personnel who responded after Harvey barreled ashore in South Texas on Aug. 25. State legislators quizzed Texas Land Commissioner George P. Bush about the Alamo and a long-range master plan, and asked him to look for ways to provide more transparency in the management of the historic mission and battle site. “We need to get it more simple, and clearer,” Sen. Jane Nelson, R-Flower Mound, said at the conclusion of an hourlong exchange Tuesday between Bush and the Senate Finance Committee, which Nelson chairs. Officials from areas devastated by Hurricane Harvey on Tuesday said federal agencies continue to complicate local efforts to provide temporary housing and prepare for future storms. At an informational meeting on Harvey recovery efforts held in Richmond, local officials told Texas Land Commissioner George P. Bush that many of their constituents with damaged homes are still unsure whether they will receive money from the Federal Emergency Management Agency. AUSTIN - Commissioner George P. Bush recently announced the donation of Carl Flemming's 1844 map of Texas to the Texas General Land Office Archives and Records from Carol and Morris McIntyre of Kerrville. AUSTIN — Vice President Mike Pence on Wednesday promised Texans still struggling in the aftermath of Hurricane Harvey that the federal government will be with them until the recovery is complete, working closely with the state and local governments. “Our promise was we were with you today, we’re with you tomorrow we’ll be with you every step of the way,” Pence said, recalling the pledges he and President Trump made soon after the hurricane. DALLAS (AP) — Texas landowners who live along a river separating them from Oklahoma have reached a settlement with federal officials saying the Texas border lies with the meandering flow of the river. 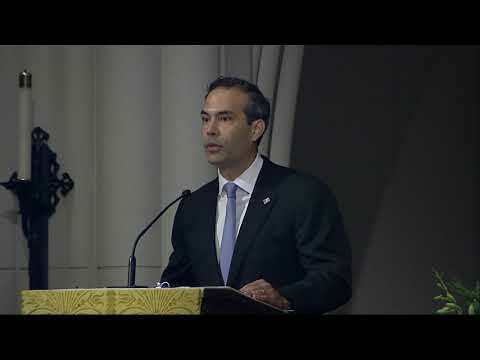 SAN ANTONIO (AP) — An activist who has criticized Texas Land Commissioner George P. Bush's oversight of a $450 million renovation of the Alamo has announced a longshot bid to take Bush's job. AUSTIN ­-- It could take as long as the year 2020 before some homeowners get federal funding to permanently rebuild or fix their Hurricane Harvey-ravaged homes, key state officials told a Texas Senate committee on Tuesday. SAN ANTONIO (AP) — Remember the Alamo? A new Texas battle is brewing over how best to do so. Texas General Land Office Commissioner George P. Bush, speaking to a crowd in front of the Alamo on Monday afternoon, announced that the state will partner with Texas A&M University’s Conservation Research Lab to restore and preserve seven cannons used during the 13-day siege and battle in 1836. In a statement Saturday, the Texas General Land Office said it is working with the U.S. Coast Guard to test the vessels for oil leaks. Commissioner George P. Bush, son of former Florida Gov. Jeb Bush, says that the hurricane's destruction will "require a long recovery." Gov. Greg Abbott has responded capably to the chaos of Tropical Storm Harvey, and his scheduled appearance today in Port Arthur is part of that outreach. Abbott plans to assess storm damage to public housing along with Housing and Urban Development Secretary Ben Carson, Land Commissioner George P. Bush and recovery czar John Sharp. That's an impressive lineup, and it helps Southeast Texans feel that they are not being forgotten in the battle that lies ahead. Bush's grandfather, President George H.W. Bush, was once a Texas congressman and his uncle, George W. Bush, won two Texas gubernatorial elections before leaving for the White House.